Living in the town of St. Louis Park, Minnesota, the Croteaus were a small family of three until the arrival of his sister, Shirley Marie, on December 14, 1943. Wilbur attended school until he was about 15 years old. He dropped out after two years of high school, likely to help his family during the worst of the Great Depression. He worked as a semiskilled routeman up until his move to Los Angeles, California where he was drafted. Croteau grew up in the town of St. Louis Park, Minnesota, which was a huge contributor to the war effort. Nearly everyone, from women and children, to young men and elders, were willing to do their part. According to the St. Louis Park Historical Society, “on Valentine’s Day 1942, 737 men between ages 20 and 40 registered for duty at the Village Hall.” Citizens traded in their vehicles for bicycles to help conserve rubber. Local colleges offered courses to young women so they would be educated to fill the labor shortages that were left by the men who were shipped off overseas. The beginning of America’s involvement in World War II affected the west coast the most. Californians not only played their part in the war by rationing and enlisting to go overseas, but they also had to be prepared if Japan were to launch another attack on the United States. The San Francisco Bay area was transformed into a massive shipbuilding operation practically overnight. Thousands of mothers placed their children in daycares while they worked long days contributing to the creation of these massive battleships. Many of the historic ship building sites still remain in San Francisco to this day as a reminder of the great contributions the state made during one of the most significant wars the world has ever seen. Wilbur D. Croteau was drafted on August 18, 1942. He volunteered to join the paratroopers and the 101st Airborne Division, 506th Parachute Infantry Regiment. The regiment was originally stationed at Camp Toccoa, Georgia and was activated on July 20, 1942, nearly one month before Croteau’s enlistment. It was commanded by Colonel Robert Frederick Sink, from North Carolina. Colonel Sink trained the men of the 506th Infantry Regiment with one of the most difficult schedules of any American military unit serving in World War II. This regiment was made up of three battalions. Croteau belonged to 3rd Battalion, G Company. Between the three battalions, 7,000 soldiers were recruited and trained for 13 weeks. By the end of these excruciating weeks of ‘A’ stage training, only 2,000 of the strongest men remained. Croteau was one of them. Members of the 506th Parachute Infantry Regiment played a very important role during the D-Day invasion of Normandy, France, on June 6, 1944. In this parachute combat assault, known as Operation Albany, over 6,900 paratroopers of the 101st Airborne Division landed inland five hours ahead of the D-Day landings. They descended into the southeast corner of the Cotentin Peninsula of France from more than 400 C-47 troop carrier planes. However, the landings were scattered outside of the intended area due to bad weather and ground anti-aircraft fire from the German ground troops. Croteau volunteered to be a pathfinder, and landed in one of the earliest waves on D-Day. Reports indicate that he landed just after midnight, west of Saint-Côme-du-Mont and faced intense enemy machine gun and anti-aircraft fire. Their job was to set up Landing Zone D and organize the men who would follow him. The 506th Parachute Infantry Regiment was intended to be in battle for three days, but those three days turned into a painful 33 days. The paratroopers did not return to England for nearly a month due to the battle for Carentan. About 2,000 men from the 506th Parachute Infantry Regiment jumped into Normandy; 569 of these heroes were wounded, 183 were reported missing or considered POWs, and 231 were killed in action. However, Wilbur Croteau survived three days in battle, dying on June 9, 1944 in fighting around Saint-Côme-du-Mont. He was awarded the Bronze Star and Purple Heart for his acts of heroism and achievement. My name is Kiera Hill and I have had the privilege of researching an extremely heroic soldier by the name of Wilbur D. Croteau. He was one soldier of many who gave their lives during World War II. Our lives are something that we take for granted, and there is no possible way I could imagine giving mine up for such a heroic cause as Wilbur did. There is no easy way to describe the sacrifice that Wilbur made for our country, but through my research, I have learned a lot about the family and life that he had to leave behind. He was sent off to fight in World War II against Germany at the young age of 21 with only two years of high school education. He left his entire life behind, along with his mother, father, and younger sister to go defend his country. Whenever the calendar reads June 9, I will always be reminded of Wilbur Croteau fighting in France alongside many other brave soldiers like himself while being shot at by the German enemy. I will remember the sacrifice that he made that was greater than most people will have to face in their entire life. And most important of all, I will remember the heroic, brave, and selfless man from St. Louis Park, Minnesota, by the name of Wilbur David Croteau. It is crucial that we remember to honor the soldiers who heroically gave their lives for their country during World War II. Though it is not much, a memorial such as this one can honor the memory of someone who has been lost to the atrocities of war in the passage of time. It is a way to pay respect to Wilbur Croteau for making the greatest sacrifice anyone could possibly imagine. He willingly complied with draft orders to protect our country from the Axis forces in World War II, and fearlessly dropped behind enemy lines in the region of Normandy, France, alongside his fellow war heroes. Learning about his family through census records and his life before he enlisted in the war really helped to open my eyes about this man’s life and how he selflessly gave it all up for a righteous cause. He was someone with aspirations, dreams, and future plans for when he returned home from war. Croteau was an average individual who chose to do something larger than himself. This project has put things into perspective for me and has helped me to realize how precious the gift of life really is. I am honored to have this eye-opening opportunity to create a memorial for Wilbur Croteau, as it has allowed me to honor such a brave soldier and help his memory to live on forever. Croteau, Wilbur; World War II Army Enlistment Records, 1938-1946 [Electronic File], Record Group 64; National Archives and Records Administration [retrieved from the Access to Archival Databases at https://aad.archives.gov/aad/, January 12, 2017]. 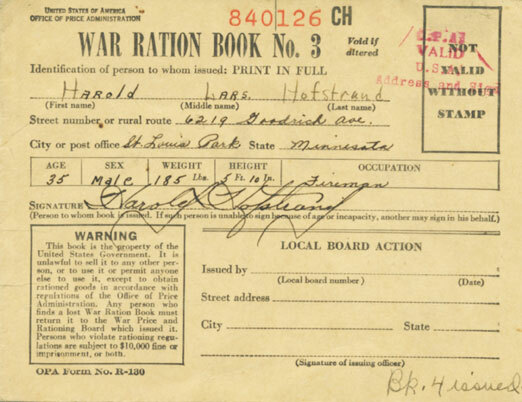 Photograph, World War II Ration Book issued by the St. Louis Park Commodity Allocation Board for Harold Hofstrand. 1943. St. Louis Park Historical Society. Image. http://slphistory.org/wwii/. 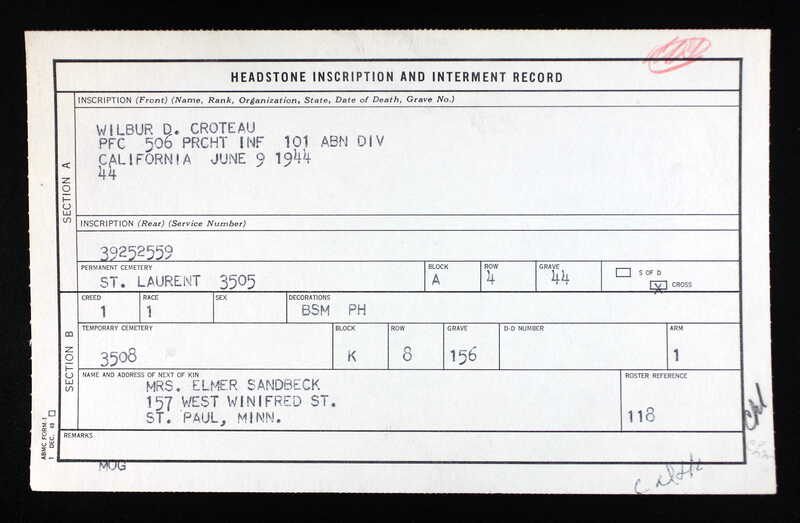 Wilbur D. Croteau, Headstone and Interment Records for U.S. Military Cemeteries on Foreign Soil, 1942-1949. Digital Images. http://ancestry.com. World War II ration book issued by the St. Louis Park Commodity Allocation Board. 1943. St. Louis Park Historical Society. http://slphistory.org/wwii/. Image. “The 506th Parachute Infantry Regiment Unit History.” The 101st Airborne World War II. Accessed March 20, 2017. http://www.ww2-airborne.us/units/506/506.html. Lefebre, Laurent. “D-Day Pathfinders). American D-Day. Accessed October 17, 2017. http://www.americandday.org/D-Day/Airborne_Division-Pathfinder-Plane_9.html. "Wilbur Croteau." American Battle Monuments Commission: Burials and Memorials. 12 January 2017. https://abmc.gov/node/408023#.WItvwogrLnC. “World War II.” St. Louis Park Historical Society. Accessed February 16, 2017. http://slphistory.org/wwii/. “World War II in the San Francisco Bay Area.” National Parks Service. Accessed February 16, 2017. https://www.nps.gov/nr/travel/wwiibayarea/intro.htm.